It’s Spring and it’s beautiful! The 2015 Naisbitt-Bagley Team Seller Newsletter Update for Spring 2015 is Here for You! 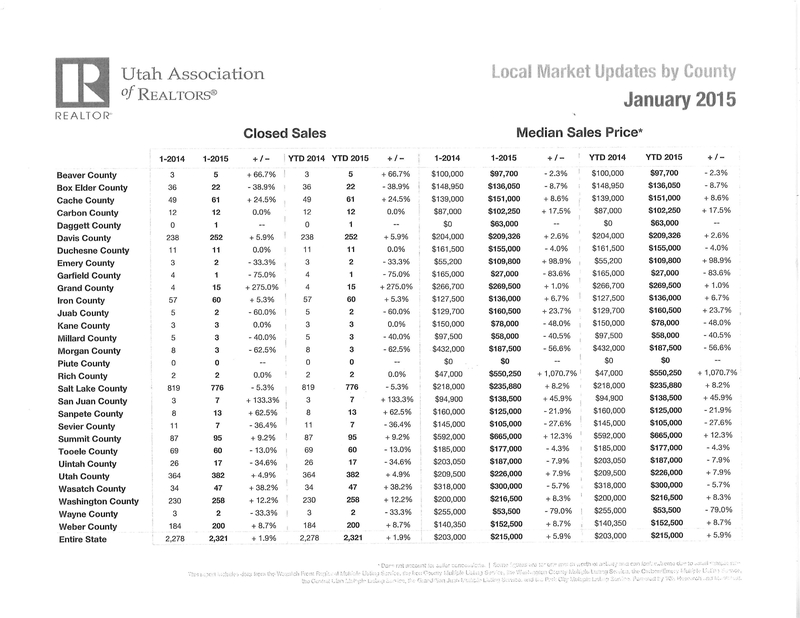 From the Utah Association of REALTORS (UAR), attached please find all of the “Local Market Updates by County January 2015.” It takes UAR approximately 2 or 3 months to compile statistics for every county in Utah, so this report is the most current available. Iron County closed sales are up year to date (YTD) 5.3%, and Median Sales Price for Iron County is up 6.7% to $136,000. This is good news. Homes are selling and quickly if priced to sell. Low interest rates and great property values are teaming up to give local buyers affordable monthly house payments, often less than rent, even though prices are on the rise. Our reduced inventory helps our local real estate market to remain steady and sometimes attracts multiple-offers since there are not quite enough homes to go around for all of the buyers. Commercial and development properties are not attracting very many buyers yet, but we are receiving more calls on those types of properties which is a good sign that change is on the way. Lots are selling; homes are being built and there are speculation homes on the market for sale. Aggressive Marketing is a must! Our top marketing is there for you both in print and online and will continue. We know of none better! Overpricing is dangerous if you want to sell. Call for an analysis of value to see if a market reduction in price is needed. Buyers buy homes approximately 90% on emotion, so we want yours to generate those warm and fuzzy feelings you get when a homes shows well. The buyers can’t buy it if they can’t see it, so it is best to allow the buyers to tour the home when they are available to tour. It’s Really Winter 2015! Naisbitt-Bagley Team Real Estate Market Update For You! The Market is Warm Even Though the Temperature is Not! We have good news predicted for the real estate world coming up! From the REALTOR January/February 2015 Magazine, “2015 Forecast: Gains Ahead–Continued economic growth and more reasonable lending standards could unleash pent-up demand for home sales.” By Robert Freedman. MReport for January 2015 mirrors the above with the following, “The Good News–With lending loosening, potential homeowners and mortgage professionals should be optimistic about the future.” I believe the above is great news and that our local area real estate market is steady and growing! 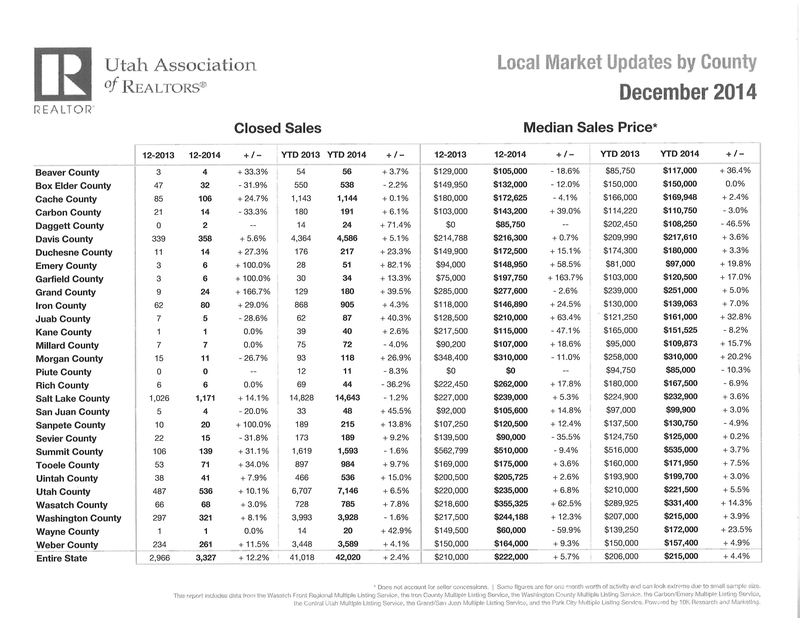 The latest report available from the Utah Association of REALTORS (UAR) shows closed sales up for Iron County by 4.3% year to date (YTD) as compared to 2014. If you take a look at December 2013 sales as compared to December 2014, closed sales for that month were up 29%! Winter is not experiencing the big slow down of years past. Since it takes UAR 2 to 3 months to compile statistics, the December report is the currently released Local Market Update by County and it is attached, so you can see all of the county statistics. The Median Sales Price for Iron County is $139,063 which is up YTD by 7%. This is great news indeed for the home sellers in our area It is also very good news for our buyers when they realize that prices are still affordable when coupled with low interest rates to equal a home payment that is often lower than rent! Why buy a home for the landlord when home buyers can own their own dream home now? New construction is definitely available to home buyers and lots are selling when priced to allow that construction to appraise once the home is built! Commercial buyers are still a bit rare and land developers are not yet back in the scene. I am hoping that will occur soon, and we are receiving phone calls that seem to indicate we are heading forward on that front too! It is always important to price your home or property with the market and to have it in show perfect condition to attract an offer from that buyer that tours your home. The Naisbitt-Bagley Team aggressive marketing is working, and we will continue to market aggressively to mark your real estate sold. Please call us today to discuss pricing and staging if your home or property is not attracting buyers or offers. If that is the case, a market adjustment needs to be made. With our outstanding advertising, you should be receiving showings and offers if priced correctly and staged beautifully. Please call your Naisbitt-Bagley Team at 435-865-1019 at ERA Realty Center or email bagleyteam@gmail.com for your free real estate consultation. (Please use bagleyteam@gmail.com rather than our old email addresses that don’t seem to be working right now.) We would be happy to use our top service, experience, training and expertise to benefit you in helping you reach all of your real estate goals, so please contact us today. You can also text or call our team: Matt Bagley at 435-590-8788, Janet Naisbitt-Bagley at 435-559-7772 and Jennifer Corral at 435-559-0366. We work together for you!